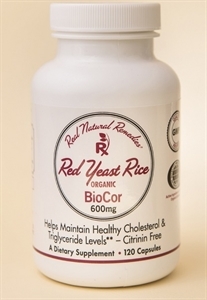 Real Natural Remedies Red Yeast Rice contains the same red yeast rice used to manage cholesterol in the research studies published in the Annals of Internal Medicine, the Archives of Internal Medicine and Mayo Clinic proceedings. Red yeast rice can manage bad LDL cholesterol levels, good HDL cholesterol levels and triglyceride levels. It provides an alternative for individuals intolerant to statins or those seeking an all natural remedy to manage cholesterol. Red yeast rice is a product of fermentation of rice with a strain of yeast called Monascus Purpureus. It has been used in the U.S. as a natural alternative to manage cholesterol since the early 90s. The Chinese have been using red yeast rice for over 1000 years. Most notable uses were for digestion, re-invigorating blood and as a food coloring agent for such Chinese dishes as Peking Duck. Red yeast rice contains naturally-occurring substances called monocolins. One particular monocolin called Lovastatin is believed to be converted in the body to a substance that inhibits HMG-CoA reductase, an enzyme that triggers cholesterol production. The cholesterol effect of red yeast rice has been found to be greater than that obtained from equivalent doses of the pharmaceutical form of lovastatin (Mevacor). This is due to the presence of other substances in red yeast rice besides the HMG-CoA reductase inhibitors that have hypocholesterolemic activity, for example phytosterols. It works in the same fashion as cholesterol drugs like Mevacor but in a much gentler way. Our red yeast rice is grown and processed entirely in the U.S. by the only domestic manufacturer. Using only the purest ingredients and high production standards the premium quality of our red yeast rice is consistent from capsule to capsule. It is tested to have the appropriate level of the active ingredient for both efficacy and least likelihood of side effects. Careful management and detailed analysis of every batch insures no measurable level of the toxin Citrinin, which has been found in other brands.